Aliça Tibbs, née Bryson-Haynes, grew up in Subud in the UK where she was opened at 17. She currently lives in Australia, where she is an active helper in the Melbourne group. 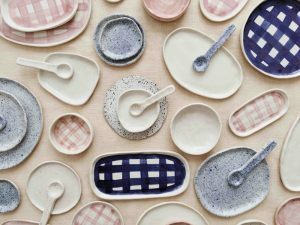 RARA Studio (www.rarastudio.com) is a ceramics business Aliça established in Melbourne in 2015. She designs, hand-builds and hand-paints all the pieces herself. They are unique, functional items for the home and to wear, and are made using a range of clays and techniques. Each piece is a one-of-a-kind. She uses food-safe glazes and fires to stoneware temperatures, making the items strong and durable. RARA Studio already has 14 stockists in Australia, and also ships to Japan and Denmark. As Aliça explained during her presentation to the SESI $100,000 Project Fund at World Congress in Freiburg, her business is growing steadily and she is currently struggling to keep up with demand. Part of this is due to the fact that she has to transport her work to be fired outside her studio. This takes time and increases the risk of damage and breakage. For this reason, money for a top-loading, electric kiln, was part of her request to the fund, towards which she received $5900. Here is the proposal that Aliça submitted to the fund jury.